Unlimited Supply of Ultra-Pure, Healthy Water for Drinking, Cooking, Coffee & Tea Brewing - Better than BOTTLED Water! 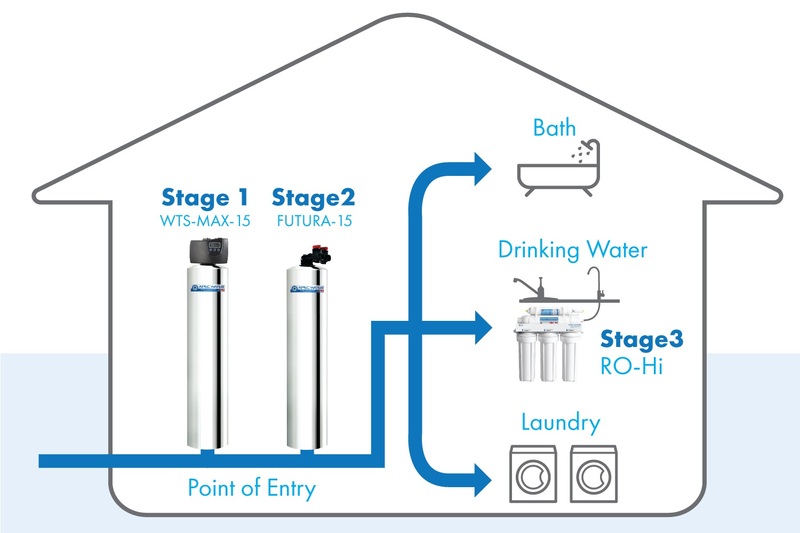 The Total Solution is a multi-system whole house water purification package that delivers high quality filtered water to every outlet throughout your entire home. This new generation “smart-filtration” system was designed to efficiently provide different levels of filtration based on your specific household needs - it delivers ultra-pure drinking water to your kitchen, chemical & odor free water to your showers, reduced-scale softer water to your pipes, and cleaner water throughout your entire home. The Total Solution can be easily installed into any standard home plumbing system and is fully automated requiring very minimal maintenance to provide many decades of quality water for your home. Quite simply, it is our most complete and effective whole house water treatment solution ever, and for a limited time, we are offering it at an incredibly low manufacture direct introductory price! Scale reduction in pipes and all water appliances for improved performance, efficiency and longevity. APEC’s Total Solution system was designed for performance, durability and reliability. We are one of the very few manufacturers who still insist on using premium components and all three systems in the package are designed, engineered and assembled in the USA. Our products are made of heavy-duty, durable tanks, housings, and parts which can withstand extreme pH and pressure changes without leaking, making them some of the longest lasting systems in the industry. 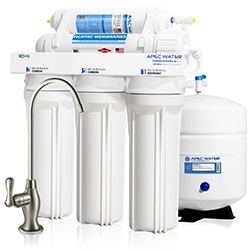 For over 20 years, APEC has been the leading manufacturer of high performance water systems. Our filtration products are built to meet the most demanding applications in water treatment-- from drinking water for homes, health care facilities, and research labs to chemical-free, manageable water for factories. We design all our water filtration systems to last for decades and to provide customers with the highest quality water enjoyment and convenience. Premium coconut-shell catalytic activated carbon removes chloramines, chlorine, VOCs, odors and chemicals from your water. Pre-programmed backwash control for superior media performance and durability, improved carbon bed contact, and regeneration. Less chance of water channeling, media fouling and carbon fines release. Comes pre-programmed and does not require pre-treatment or yearly maintenance. Save time, money and labor with this automated user-friendly system. Comparable benefits of a water conditioner without the use of corrosive salt and chemicals. Enjoy softer hair, skin & clothing. Salt-free systems are also better for the environment and human health. Prolongs the lifespan of pipes and home appliances by preventing new scale and reducing existing scale in your home. Much easier cleanup of hard water spotting on mirrors, dishes, sinks and showers. Easy one time installation with no maintenance required. Media lasts many years before replacement - No more monthly salt refills will save you time, money and hassle of dealing with heavy, messy bags of salt. Guaranteed ultra-pure, best tasting drinking water quality comparable to premium bottled water brands – available only through the RO process. Removes the widest range of water contaminants including arsenic, fluoride, nitrates, perchlorate, heavy-metals and bacteria – contaminants not treatable by whole house systems. Convenient purified drinking water at your fingertips. No more costly bottled water, heavy water lugging & monthly faucet filter changes. Save up to $849 per year compared with bottled water costs. Upgraded 3/8" output quick dispense design will increase water flow rate 2X faster, greatly reducing wait time to fill up a glass or pitcher of water. Input / Output 1" MNPT Bypass Adapter Standard 1" FPT Bypass Adapter Standard Input: 1/2" or 3/8"